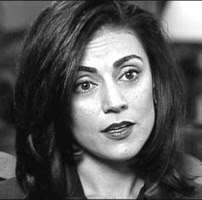 The Hollywood Liberal grabbed a half hour of Henry Waxman's time the other day (Waxman's district includes Hollywood) and the interview touched on a great many subjects, including Sibel Edmonds. As regular readers will remember, Sibel was thrown overboard, then gagged, when she told credible and verifiable tales of treachery in the FBI and elected and appointed officials who seem allied to a foreign country. Luke Ryland, aka Lukery, who by my reckoning has done more than everyone else on the planet combined to keep Sibel's astonishing yet credible tale from going down the memory hole, picked up on the conversation and reposted the segment having to do with Sibel. In addition to his fistful of blogs, Luke regularly posts Sibel-related material at Daily Kos, where not so long ago her story was viewed as tin-foil-hat material. But lately Luke has been making sense to the Kossacks and they've been getting behind the drive to pressure Waxman into holding hearings for Sibel, and allowing her to speak -- in public, for the record, and without fear of imprisonment -- of all the things she learned in her short time working as a language specialist for the FBI. Considering that her story involves international terrorism, illicit trafficking in drugs and nuclear technology, undeniable signs of treason, and much else, she would certainly be an interesting witness. Waxman's office knows her whole story, that it's been confirmed repeatedly by thoroughly reliable people, and that thousands and thousands of Americans want her to be allowed to speak. After Waxman spoke to HL about Sibel (no opinion of the case, no plans to hold hearings), Luke posted about it at Daily Kos, and some of the Kossacks have been a bit unhappy. Rightfully so, in my opinion, and clearly Luke feels the same way. No doubt Sibel does as well. I've been itching to blog about this, but I've been busy dealing with all sorts of zaniness elsewhere (such as Washington, Islamabad, Iraq, Philadelphia and Phoenix, to summarize yesterday's headlines), so I've just been reading and waiting and reading some more ... and now HL has augmented the story with a post drawing on My Left Wing and talking about the spooky pre-DK history of the King Kossack himself, Markos Moulitsas Zuniga, who -- get this! -- "grew up" as a Reagan Republican, and was fully trained by the CIA! The “Kossacks” as they are called were all waiting for Henry to schedule the hearings about a case that involves drug running, trading state secrets, trading nuclear information with Turkey, and Israel, and involving both Democrats and Republicans. They all thought Henry was just biding his time. When they heard Waxman tell me in the interview that he had no opinion about Edmonds, and no intention of scheduling hearings for a state department employee and FBI whistleblower, some of the Kossacks began to have meltdowns proclaiming that this was the last straw, and they now finally see that Democracy is BS, and the whole thing was just a joke. That’s because they have been buying into that whole Kos mindset of working within the system, of lets just sit back and wait for the democrats to save us while the Republicans run roughshod over the US treasury, and the American people for 8 years. Welcome to the world of reality people. Luke Ryland @ DailyKos: Henry Waxman finally speaks out on Sibel Edmonds Case!